For rent in Dalyan: a fully air-conditioned, child friendly, illa in a great location, with a stunning large twelve metre length private pool and separate children's / splash pool. 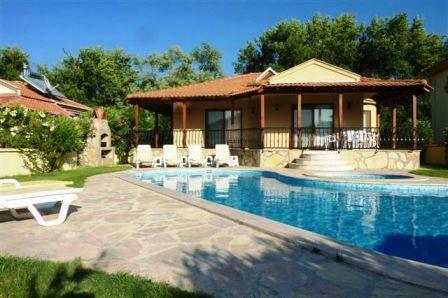 Villa Lochville in Dalyan is the perfect family villa rental choice and when you rent our Dalyan villa in 2019, it has free Wi-Fi and air conditioning included in the rental price. The villa also has an alarm system fitted for added security. 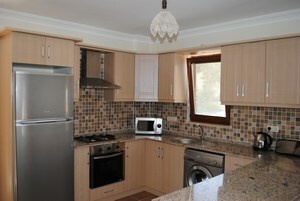 Rent Villa Lochville direct from the owner and save money. We don't charge a booking fee, or commission and if you are worried about fake listings and fraud, we have that covered as well. One way to protect against fraud is to pay by credit card, so in 2017 we started taking credit cards to give you peace of mind. Under Section 75 of the Consumer Credit Act, any purchases you make that are worth between £100 and £30,000 are protected by your credit card provider. Our modern, two bedroom sits on a large plot and is an exceptionally spacious, all en-suite, extended detached villa with additional family bathroom in Dalyan, Turkey is suitable for 2 to 6 guests and is very well equipped. Villa Lochville is located in a quiet area of Dalyan with the town centre only a 12 minute walk away, and there are no hills. 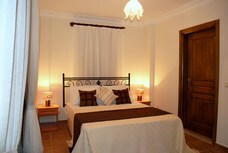 Car hire is not required when you rent Villa Lochville as we can also arrange airport transfers for you, if required. Villa Lochville in Dalyan is 25 minutes drive from the International airport of Dalaman where flights are available all year round. 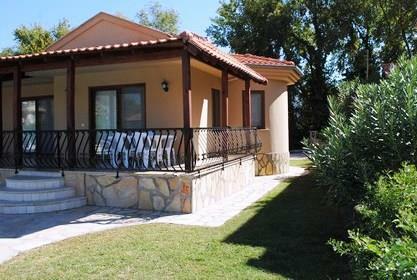 Villa Lochville is also available for rent all year round with sensible rental prices offering good value, family holidays. We are able to provide a baby cot and highchair upon request. You will find pictures of every room in Villa Lochville on our "Villa" page along with views of the 12 metre length private pool (for your own use) and large, landscaped garden with lovely soft terracotta coloured garden walls. The pools are being retiled for April 2019, but will still have a lovely blue mosiac pattern. 2019 will be our 12th season of renting our own private villas in Dalyan and are able to offer a selection of 2 and 3 bedroom detached villas, all with superb extra large private pools and separate children pools. Dalyan: Whether you are seeking beach relaxation, family fun or action packed days out enjoying the great climate, Dalyan has it all. Dalyan has a typical Mediterranean climate, with hot dry summers and mild wet winters. The main tourist season runs from April to October but Dalyan remains open all year round. Located by a stunning river in a green valley, this conservation area is a region of unspolit natural beauty with a stunning beach nearby, and an ideal place in which to relax and enjoy the wonderful hot sunny weather. Dalyan has many charming shops and restaurants, perfect for that early evening stroll. Contact us if you would like to rent Villa Lochville, or make an enquiry about renting the villa, or would just like additional information. We always repond to enquiries within 24 hours.